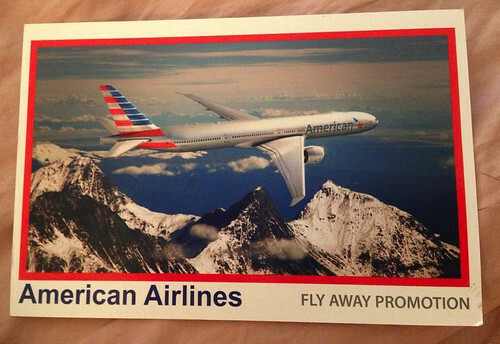 Both my brother and a reader have mentioned to me that they’ve recently received postcards that prominently display a photo of an American Airlines plane with the new livery on one side, and the American Airlines brand identity on the other. Call within 48 hours and receive a 3 day and 2 night hotel stay at major brands. The phone number on the card points to “Paradise Forever”, a company that’s selling membership in a private travel club: this is not a postcard from American Airlines. 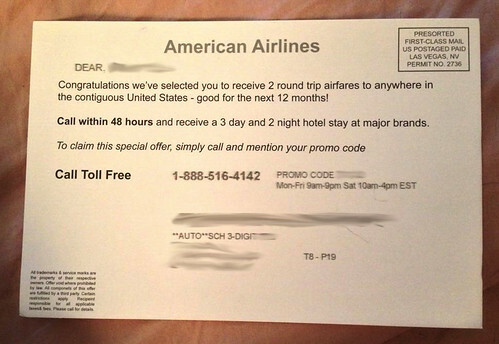 Despite this disclaimer, many reasonable people may believe that they have won a prize in a sweepstakes contest and that this postcard comes from American. Just to be clear, this is not a postcard from American Airlines. Others who see it may believe that it’s a fake American Airlines postcard and that American’s plane and brand identity are being used by Paradise Forever to deceive people. Not sure if that’s the case, but I do know that this is not a postcard from American Airlines. The phone number 1-888-516-4142 does not belong to American Airlines. There is no “Fly Away Promotion” from American Airlines. The Title Tags on this Paradise Forever page have been optimized for those who wonder if this is a scam. Not sure why they optimized the page for the keyword ‘scam‘, but just to be clear, this is not a postcard, promotion, contest, or sweepstakes from American Airlines. I guess SEO is important to them. If you ever have questions about an email, postcard, or fax that looks to be from American, consult the AA website for latest info regarding scams, fraud, and fake postcards. A big thanks to Jim M for sharing these photos! these same turds keep faxing the offer to our business fax. I have seen offers from “US Airlines”, an airline that does not exist.